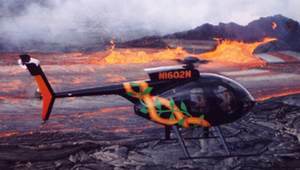 In what must be one of the slowest EIS processes on record, the National Park Service and the Federal Aviation Administration is moving…methodically…to develop a new air tour management plan (ATMP) for Hawaii Volcanoes National Park. After being upgraded from an EA to an EIS in 2005, the joint planning process began work on the EIS in 2007. Four years later, rather than releasing a Draft EIS, the project planners have released a first draft of the proposed alternatives, and are asking for comment on these. After incorporating comments, the DEIS will follow. Sometime. All ribbing aside, the fact is that this is actually one of the faster moving ATMP’s coming out of the seemingly uncomfortable partnership between the FAA and the NPS, which were jointly charged in 2000 with developing ATMPs for all parks with existing or proposed flight tours. The Park Service has taken a lead among federal agencies in addressing impacts on natural soundscapes of parks, while the FAA’s focus is more on air safety than resource protection. You can download a newsletter that shares the draft alternatives, and submit comments, from this page; see the full project planning website here; and check out a short video and news report on the process here.